As I await the publication of Against Time: Letters from Nazi Germany, 1938-1939, the story of my parents’ emigration to the United States, I am trying to give readers here an idea of what was involved in those tense times. There were difficulties from both sides: the Germans made it hard to get out and the United States made it hard to get in. German policy for all practical purposes allowed taking only 10 % of cash, stocks or valuables out of Germany. Two departure taxes, the Gold Discount Bank Fee [Golddiskontobankabgabe] and the Nation Abandonment Tax [Reichfluchtsteuer] amounted, in effect, to the expropriation of up to 90% of the liquid assets of emigrants. Jewelry, silver, artworks and similar valuables were subject to the same taxes to prevent people from turning their money into objects they could export. 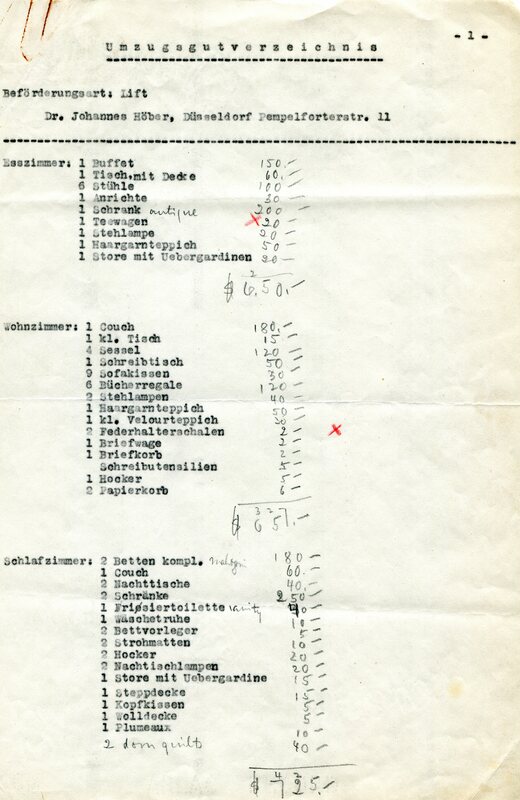 Inventory of the household effects of Johannes and Elfriede Höber required by the Nazis as a condition of leaving the country. August 9, 1939. What was permitted was the export of household belongings and personal effects sufficient for a “modest life” [bescheidende Existenz] in the émigré’s new country. Anyone planning to move out of Germany had to file a detailed inventory of everything they owned before they could get a permit to leave. The normal method of shipping was by having a moving company pack the entire household into an enormous crate that would then be transferred by crane to a ship and transported by sea. When the crate reached the United States, the household goods would be transferred to a truck and delivered to the new residence. My father came to the United States in December 1938 but my mother and my then nine-year-old sister were not able to leave Germany until late the following year. In August 1939, my mother prepared the household for shipping, and prepared the required inventory, a copy of which she later brought with her to America. The inventory was insanely detailed, down to “one wash line and clothes pins,” a trash can, a honey jar, a cookie box, six dust cloths, and a box of cloth remnants for patching holes in worn clothing. My parents were both then age 35 and had been married for ten years. The inventory illuminates the lifestyle of a middle-class European family of the 1930s. Thus, the inventory includes furniture, beds and bed linens, china and silverware, kitchen utensils and other items of daily life, but also a dozen each of wine glasses, champagne glasses, beer glasses, punch glasses and liqueur glasses. My parents’ leisure activity is shown in the listing of two pairs of skis and two pairs of ski boots as well as two pairs of hobnailed climbing shoes, a rucksack and a pair of mountaineering pants — and a picnic basket and its contents. Most revealing to me was the inclusion on the list of 800 books — mostly on economics, art history and fine arts — as well as 100 children’s books, a pretty good personal library for a nine year old. 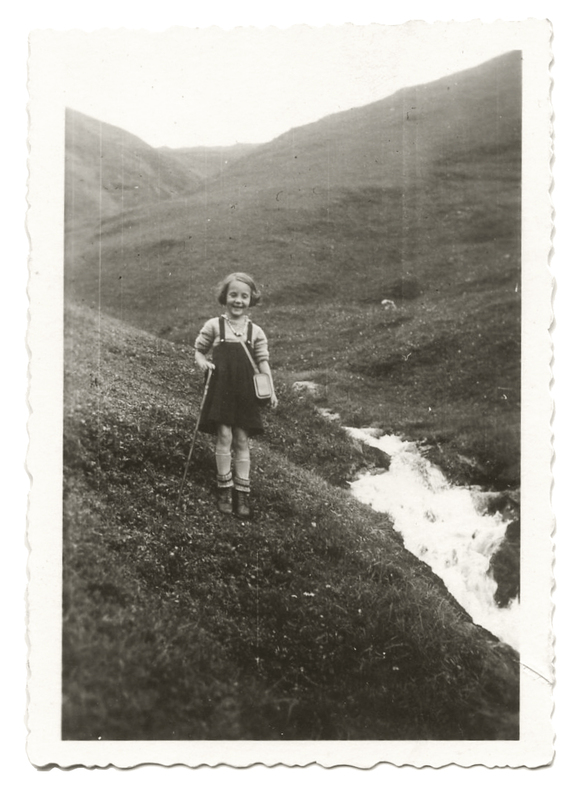 My sister, Susanne Höber, as a little girl in the Alps. The inventory of our family’s belongings showed they were people who enjoyed the mountains and also that our parents gave her lots of books. You can read the full 5-page inventory here: Inventory August 9 1939 — English translation . One of many ironies of my parents’ life is that none of these carefully cataloged belongings ever got out of Germany. My mother was still in Düsseldorf when Hitler started World War II by invading Poland on September 1, 1939. As a result, no ships were available to transport the crate of household belongings to the United States. With no other choice available, my mother had everything put in storage and fled. Everything, from furniture to books to dust cloths, was destroyed during the Allied bombing of Düsseldorf on June 12, 1943.